Sam Karl hit a hat-trick in Loxwood's 4-1 away win over Little Common back in December. Picture by PW Sporting Photography. 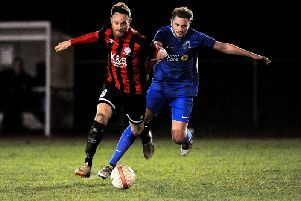 Alex Walsh will not be putting any added pressure on his Loxwood team as they gear up for Saturday's crunch Premier Division relegation clash at home to Little Common. A mere four points separate the Magpies in 16th and 18th-placed Common as the season reaches its business end. Both sides are currently winless in four, with Little Common now just two points away from the drop zone after the resurgence of second-from-bottom Eastbourne United. Victory on Saturday is vital for the Plaistow Road-outfit but Walsh stressed that his side didn't need any reminding of this. The Loxwood boss preferred to focus on how far the Magpies had come under his tenure and felt that they have the quality to move themselves away from the relegation scrap. Walsh said: "I think the players know the importance of the game. They don't need me or anybody else telling them that. "We've hit a little bit of bad form but at the moment we're not getting battered by teams. It's been by the odd goal and we're still very competitive in games. "We've got enough quality to win four on the spin. We know it's not been the ideal set of results but we know that a win is just around the corner. "We've done really well and we're in a great position. We're six points clear of the drop zone and we've done a lot of great work to turn it around from where we were. "We just need to go and get them few wins that we need and hopefully it'll start on Saturday and we can start enjoying it again." The two teams met at The Recreation Ground back in December and it was Loxwood who picked up the three points after a 4-1 win. A Sam Karl hat-trick and an own goal from a Common defender helped the Magpies notch up their second victory under Walsh's tenure. This game has given the man-in-charge at Plaistow Road a good indicator of the threats posed by Saturday's opponents. Walsh added: "Little Common are a tight-knit group. I know a couple of the players there and they're all fighting. "They're in a position where they are outside of the relegation zone and they need to win the game as well. "We know they are good defensively. They've got some good centre-halves and Lewis Parsons is a good player so we know they're good. "We know that they are good at set-pieces. They scored against us last time from a corner so if we can be good in both boxes I expect us to give them a good test and hopefully we can come out on top."